William Shakespeare’s The Winter’s Tale, currently being performed by Groundling Theatre Company at the Winter Garden Theatre is sometimes referred to as a “problem play.” It’s neither tragedy nor comedy but rather switches between moments of intense psychological drama and moments of comedy and romance. As such, it is a perfect showcase for demonstrating the tremendous range and talent of this group of actors. The performances throughout were extremely strong. I can’t think of one weak link. I find that Shakespearean language can sometimes be difficult to follow, but the skill of this troupe made the dialogue seem natural, almost contemporary at some points. In the “tragic” first half of the play, Tom McCamus, as Leontes, conveyed a man wracked by distrust and anger at the imagined infidelity of his wife. Michelle Giroux portrayed Hermione with quiet dignity and despair. Her soliloquy at her trial was both moving and devastating. I particularly liked Lucy Peacock as Paulina, Hermione’s faithful friend and defender. She was a strong outspoken woman who was not afraid to stand up to power and injustice in the name of truth. (I saw the performance on the same day women were marching around the globe, so it really resonated with me). In the lighter second half, Brent Carver was brilliantly funny as Antigonus, the fast-talking trickster and con artist. And Mark Crawford had me laughing out loud as Perdita’s bumbling brother. His earnestness and utter cluelessness was charming and hysterical. Sarena Parmar and Charlie Gallant, as Perdita and Florizel, were sweet and innocent young lovebirds, so caught up in their own beauty and feelings that they don’t acknowledge the risks involved in their romance across class lines. It was an intimate performance (according to the website, there are only 149 seats per show), so you are up close, which allows you to see every glance, every small smile, every teardrop on the actors’ faces. Each facial expression conveys meaning and adds to the emotional power – both tragic and comic – of the show. The performance is done in the round, an unusual choice given that it is held in a traditional theatre space. Most of the seats are actually on the stage, facing out towards the auditorium. A few are in front row of the “normal” seating area. The majority of the action takes place at the front of the stage, with the actors exiting and entering from all directions — to and from the traditional backstage and in and out of regular seats. I thought the staging worked very well. Even though sometimes the actors had their backs to me, I always could hear and understand what was going on. A highlight for me was the storm scene, with flashing lights and thunder bouncing and echoing across the empty cavernous house. One caveat though – getting to the seats on the stage involves a fair bit of walking up and down narrow, badly lit steps and risers. If you have mobility issues, ask for seats on the floor. I’m a big Shakespeare fan and feel fortunate that Toronto is rich in opportunities to experience his work. 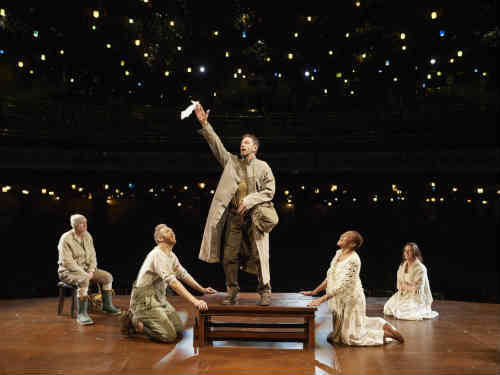 Groundling Theatre Company is a great addition to the city’s Shakespeare community, and The Winter’s Tale was one of the best productions I’ve seen. Don’t miss it. The Winter’s Tale runs at the Winter Garden Theatre (189 Yonge Street) until February 18, 2017. See website for performance dates and times. Tickets are $29, $64, and $79 and may be purchased online or by calling 1-855-599-9090.